Below 2000' and often close to the ocean. Plants do not tolerate frost. 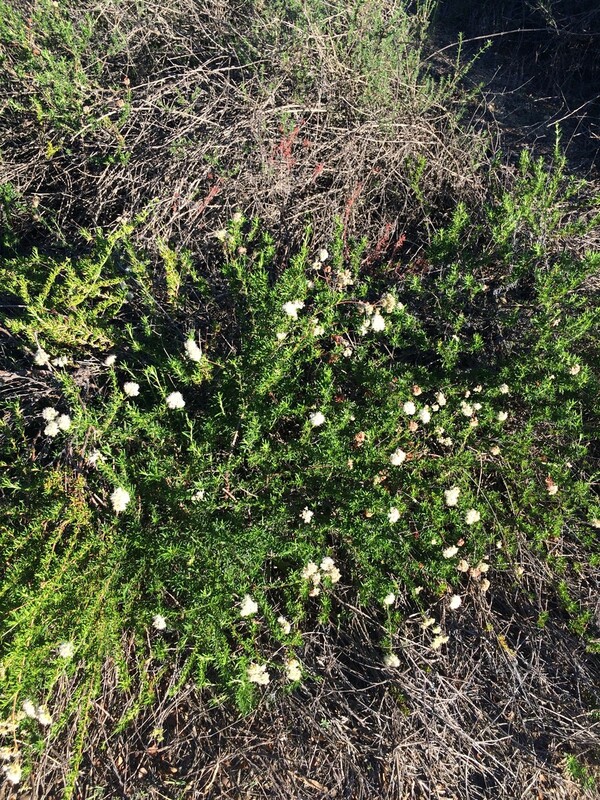 On S slopes, plants are usually drought deciduous shrubs with small leaves that grow no higher than 6'-8', but often less. On N slopes, plants are evergreen, have larger leaves, and can grow to 15'. 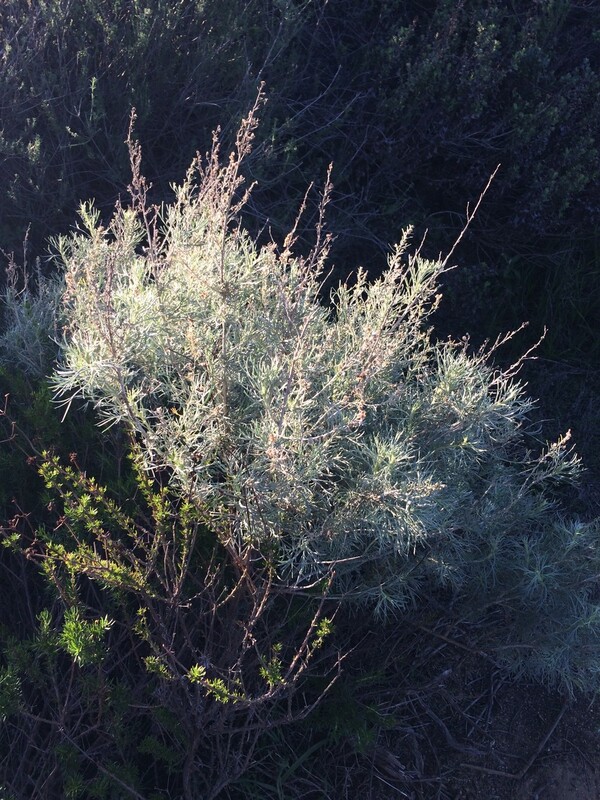 California Sagebrush, Artemisia californica; grayish shrub 2'–6'; drought deciduous,leaves thin, covered with fine hairs, clustered at axils; racemose panicle of white or yellowish flowers, Aug-Dec.
Coast Brittlebush, Encelia california; shrub to 5'; leaves simple, alternate, 1"–2", drought deciduous; flowers single, showy sunflowers, 1" wide, Feb-Jun. Bush Monkeyflower, Mimulus aurantiacus; erect shrub to 4'; oblong, opposite, 1"–2" leaves, drought decidous; 1 or more flowers in upper axils, tubular, white, yellow, orange, or red; Mar-Aug.
Black Sage, Salvia mellifera; shrub to 5'; leaves 1"–3", opposite, puckered above, hairy beneath; flowers white, lilac, or light blue, Apr-Jul. Toyon, Heteromeles arbutifolia; shrub or multistemmed tree to 15'; alternate, leathery, evergreen leaves 2"–4", toothed margins; white flowers in terminal clusters, Jun-Jul; red berries persist thru winter. Laurel Sumac, Malosma laurina; shrub or tree to 16'; alternate, evergreen, aromatic leaves 2"–4", smooth w/ reddish veins; white flowers in dense terminal clusters, Jun-Jul. Deep, well-drained soils that occur as islands within coastal sage scrub. Also canyons and north slopes within chaparral. Coast Live Oak is found below 5000'. Canyon Live Oak can be found as high as 9000'. 1000' to 5000' elevation. Plants tolerate frost, but not persistent snow. Western Sycamore, Plantanus racemosa; erect or leaning, sometimes multistemmed tree to 80'; darker bark peals away in patches to reveal lighter bark underneath; leaves 3"–5", 3 to 5 palmate lobes; tiny unisexual flowers in small clusters; fruit 1" cluster of hairy achenes. Red Willow, Salix laevigata; tree to 45'; reddish twigs; glossy leaves 2"–6". Black Cottonwood, Populus trichocarpa; tree to 125'. Fremont Cottonwood, Populus fremontii; tree to 100'; leaves w/ scalloped margins; more drought hardy and less shade tolerant than P. trichocarpa, which replaces it near the coast and at higher elevations. 4000' to 6000' elevation. Snow persists in the winter. Plants recover slowly from fire.